South Korean liquor maker Hite Jinro said Monday that it has launched its signature soju brand Chamisul in Russian liquor store chain Vin Lab, in a move to penetrate the local drink market there. 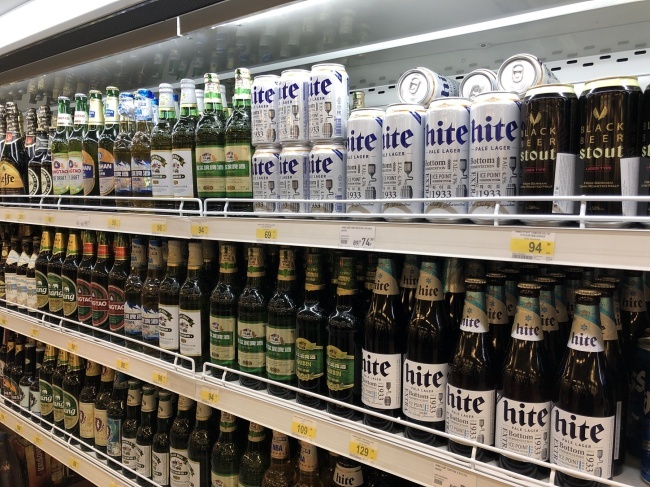 Hite Jinro said Chamisul, which has an alcoholic content of 19 percent, will hit the shelves of some 400 Vin Lab stores across Russia, where not only local consumers but tourists visit to purchase a variety of liquor products. Since establishing the Russia office of its overseas corporation, Hite Jinro Rus, in 2013, the company said it has been preparing to target the Russian market and its consumers with an aim of the globalization of soju. The company has been testing the market by introducing its soju Chamisul Fresh and low-alcohol fruit-flavored soju Jinro Grapefruit at local supermarkets and Asian food stores in recent years. Hite Jinro said it will gradually increase brand awareness by exposing Chamisul at Vin Lab and launching other kinds of Chamisul soju products with localization marketing. “Russia is a country with one of the largest liquor (markets) around the world. We will put in effort to expand the soju market in Russia and strengthen the Chamisul brand so that it can compete with other signature liquors from global brands,” said Hwang Jung-ho, director of the overseas business unit at Hite Jinro.